Diamonds are a special part of life; each one is given and received with unique meaning and emotion. The individuality of a diamond is identified by subtle differences that determine value. Collectively the evaluation criteria are referred to as the 4 C’s: Cut, Color, Clarity, and Carat. It is critically important to understand that all of the “C’s” are interdependent and must be considered collectively. A high ranking in one “C” does not guarantee a good quality stone if the other “C’s” are poor. 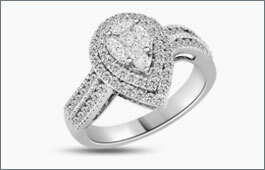 Ultimately, certified gemologists use the 4 C’s as a guide to help you understand how to buy a diamond. Here are some things to keep in mind when buying diamond jewelry. When it comes to a diamond, the cut of the diamond means everything. 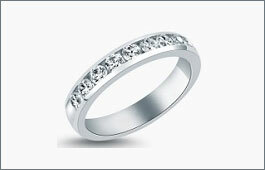 Cut, the most important “C,” is the craftsmanship that brings a rough diamond alive and gathers light into the stone. 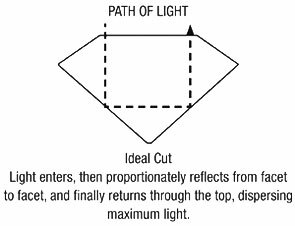 The way the facets are aligned determine how light is dispersed and which direction the light will beam out of the diamond. A poorly cut stone will diminish the diamond’s brilliance. If the crown or pavilion is cu t too deep or too shallow, light will escape straight through the top or sides rather than refracting throughout the facets. Above all, the “Cut” is the source of a diamond’s brilliance, fire, and scintillation. 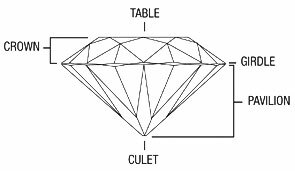 Ideal cut diamonds are extremely rare diamonds with a perfect cut that reflects maximum light. In fact, they return 96% of the light that is shone on them. They’re selected from less than 2% of the world’s diamond supply. After they’re cut, only 1% makes it as an ideal cut diamond. Ideal cut diamonds also reflect colors like a rainbow. The colored light is fire. The sparkle is scintillation. The white light is brilliance. Diamonds with absolutely no color are rare, and the majority of diamonds contain trace elements which cause a hint of color usually detectable only by a trained eye. The degree of color present in a diamond is ranked on a scale from D, which is colorless, to Z, which has very noticeable yellow or brown coloring. To measure Color, the gemologist will match a stone against a set of “master stones.” This process is abstract and oftentimes an in-between grade is assigned, such as G-H or H-I. Clarity refers to the number and degree of inclusions that are naturally part of a diamond’s growth and formation. Inclusions can appear as crystals, feathers, bubbles, or dark spots. Flawless diamonds with no inclusions are exceptionally rare and valuable. The clarity ranking is determined by the ease or difficulty of which a trained gemologist can see inclusions under 10x magnification. Diamonds are measured in carat weight. Carat weight alone does not determine a diamond’s value. A smaller diamond may actually be more valuable than a larger stone with inferior cut, clarity, and color. Carats can be expressed in fractions or points. A full carat equals 100 points. Therefore, a diamond measuring 3/4 carat (.75 carat) would be equal to 75 points. Here at Diamour, we adhere strictly to the Kimberley Process because ethical sourcing of diamonds is a top priority for us. The Kimberley Process is a United Nations-backed program to track and certify diamonds aimed at preventing conflict diamonds from entering legitimate trade. Diamour has zero tolerance for “blood diamonds” and by supporting this imperative program, we hope to contribute to ending the violent conflict and human rights abuses fueled by diamonds in Africa.